The “cocoa for a better life” model has developed an internal standard for all her requirements that is more than compliant with certifications labels like UTZ and Rainforest Alliance and includes fair trade criteria. The internal standard document of the associations is available in English and the local language with clear pictures for the illiterate. It is also available for viewing for our customers. Should they have special wishes, Ascot is willing to look into the possibilities and additional costs for other external certification. It’s the associations’ aim that all farmers are both UTZ and Rainforest Alliance certified by their second year of membership. One of the requirements for UTZ and Rainforest certification is that the cocoa should be fully traceable up to group level (8 – 12 farmers) within the association. This is made possible by providing all farmers with unique member identification (ID) linked to their thumb-mark (see chapter Farmer development/Capacity Building for more information about ID). The thumb print scanners and electronic weighing scales at the warehouses are linked to identify each sale of the certified farmer. The group ID is written down on the cocoa bags and the farmer gets a receipt of each delivery stating yield (kg produced) and revenue. For the association certification is a way to monitor, coordinate and support the internal working processes. CAA is one of the few that is UTZ Identity Preserved (IP) certified. The IP program has the highest level of certification within UTZ as IP maintains the identity of the certified producer along the supply chain. In line with this, Ascot is allowed by UTZ to trade and offer IP, Segregated and Mass Balance cocoa. 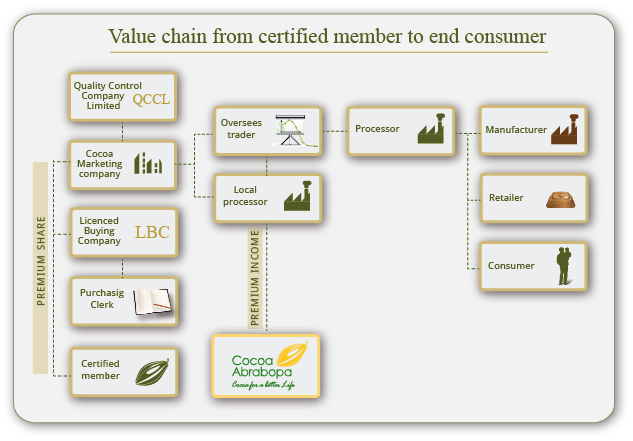 Below an illustration of the associations’ value chain from certified farm member up to the end consumer. The verticle text indicates the flow of the certification premium. Ascot pays the full 100% of this premium to the farmers associations and their certified members. What are UTZ Certified, Rainforest Alliance and FLO Fairtrade about? • UTZ Certified stands for sustainable farming and better opportunities for farmers and their families. They assure good agricultural practices and management, safe and healthy working conditions, no child labour and protection of the environment. Through the UTZ-program farmers grow better crops, generate more income and create better opportunities while safeguarding the environment and securing the earth’s natural resources. • Rainforest Alliance is built on the three pillars of sustainability: Environmental protection, Social equity and Economic viability. It encourages farmers to grow crops sustainable. It’s their believe that the best way to maintain virgin forests is to ensure that it is profitable for businesses and communities to do so. This means helping farmers and forest managers to realize greater economic benefits by protecting ecosystems within and around their operations and making sure their workers are well-trained.